Extreame Savings Item! Save 41% on the Silicon Power 128GB USB 3.0 Flash Drive, Blaze B30 by Silicon Power at Andy Pemberton. Hurry! Limited time offer. Offer valid only while supplies last. Silicon Power (SP) Blaze B30 is a USB 3.0 flash drive with 360 degree swivel design, which allows you to carry without annoying cap-loss problems. 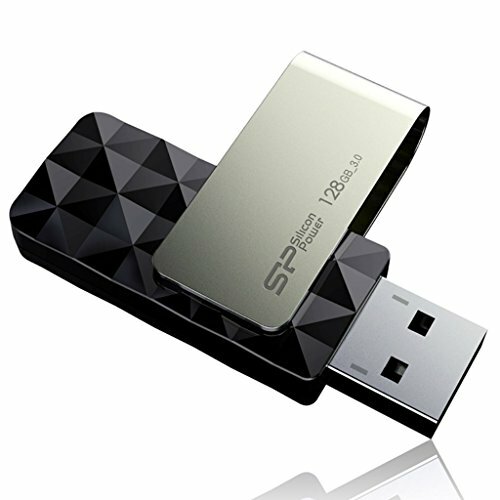 Silicon Power (SP) Blaze B30 is a USB 3.0 flash drive with 360 degree swivel design, which allows you to carry without annoying cap-loss problems. With the geometric diamond-cut pattern and stainless metal structure, Blaze B30 offers a sleek jewelry-like and practical look. It is also built-in with the LED indicator, indicating the data transfer status during use. SP B30 is backed by a lifetime warranty, and comes with SP Widget application software which provides seven major back up and Recuva recovery tool. 360 Degree Swivel Design Blaze B30 incorporates the 360 degree cap-less swivel design with the stainless metal structure. This allows users to use and store with just a thumb push, and avoids annoying cap-loss problems. Sturdy and Durable To enhance the durability of the swivel axis, Blaze B30 employs the Four-Way Positioning Rotating Technology, which can greatly avoid any damages or debris on the USB connector from loose axis. Ultra Fast Transfer Rate Outstanding read/write speed is coupled with the latest USB 3.0 interface feature a 5Gb/s bandwidth which is 10x the bandwidth of a USB 2.0 interface. It saves users precious time backing up to and from the hard drive when transferring mass data files. Windows and Mac Ready Blaze B30 is compatible with Windows and Mac, allowing you to share files between different platforms.